Why Does My Dog Rub Up Against Furniture? Dogs love it when we rub and scratch them in all the right places, and if no one is around to help out, they can take scratching duties into their own "hands" by rubbing up against your sofa or dining room table. However, there are a variety of other reasons that can account for furniture-rubbing behavior, ranging from itchy skin caused by allergies to scent-spreading. You should always mention any unusual behavior to your veterinarian, as she may be able to offer valuable insight or determine if there is a more serious underlying condition. Dogs with allergies will likely develop sneezing accompanied with fluid nasal discharge. The eye area can also quickly become irritated if your dog suffers from allergies. According to WebMD, this irritation often manifests with excessive itching. In this case, you may find that your dog keeps rubbing his face on things, including furniture (or even on the carpet) to relieve the itchy and scratchy feelings on their face. Your dog may also develop hot spots due to a food or environmental allergy, according to Cesar's Way. Hot spots are patches of itchy skin that eventually become infected due to repeated scratching. So, you might find your dog scratching his back on a chair to get to a hard-to-reach hot spot that he can't get to. Or, you could encounter your dog rubbing his nose on the bed. Again, he's using the furniture like a scratching tool to help ease these itchy patches of skin. A dog with an ear infection will likely be in a great deal of discomfort. To relieve the itchiness often associated with ear infections, dogs may rub their head against your furniture, the carpet or the walls in your home. So, you may just find your dog rubbing her face on the couch as a way to sooth her itchy ears. 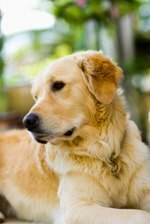 You may also notice that your dog is often scratching her ear with her foot, according to petMD. If this does not provide enough itch relief, your dog will resort to rubbing against your furniture. Have you recently started seeing your dog rubbing his face on the couch or your dog rubbing his nose on the bed? That's because he may be marking it with his scent or putting an interesting scent on himself. You may have noticed that your dog rubs up against the grass outside when there is a particularly attractive scent, like a dead animal or food. In a similar fashion, your dog may be rubbing up against furniture that smells like another dog, food or a particular enticing cleaning product. It may also be the case that if your dog keeps rubbing her face on things, she is simply marking her territory by rubbing her own scent against furniture. So when you find your dog rubbing her face on the couch, it could be because she's claiming it as her own, especially if it's one of her favorite spots in the house. If your dog keeps rubbing her face on things and is scratching herself or rubbing against furniture quite excessively, her skin is likely irritated. Consult your veterinarian so that she can examine your dog for skin infections, mites, fleas, dry skin, or an anaphylactic reaction. Some of these concerns may not be visible to the naked eye so your dog's rubbing behavior may be quite confusing to you. Your dog may also be suffering from a nasal infection or a virus if you regularly see your dog rubbing her nose on the bed. If this is the case, you might also notice some nasal discharge. Dogs can also suffer from psychogenic diseases that cause them to rub their skin violently. This can often cause wounds on the skin, so your veterinarian should address the condition at once. That's because the skin can easily become infected with repeated rubbing and scratching. Some infectious skin conditions like bacterial infections of the skin or fungal infections like scabies can be transmitted to people, so you'll want to treat those conditions right away, warns petMD. You might also want to steam clean any soft furniture surfaces and wipe down hard surfaces to remove anything that could either reinfect your dog or pass to the humans in your household.